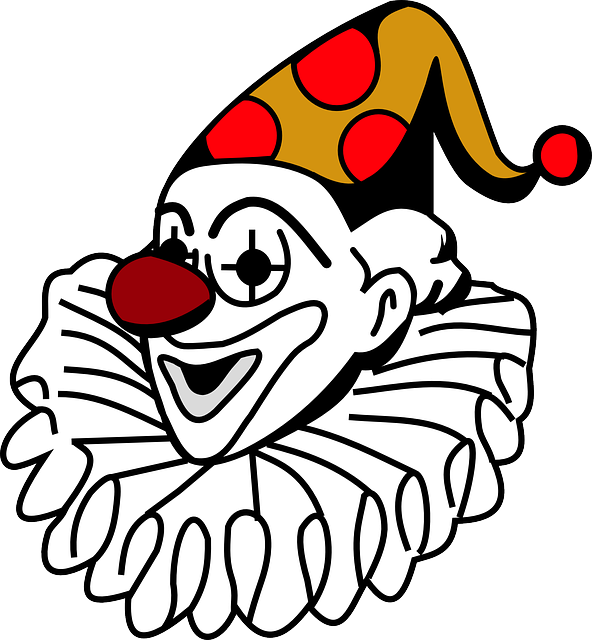 I ran with an interesting crowd in Chicago nicknamed “The Unusualists.” I will doubtless dedicate a blog post to them sometime in the near future, but for now I want to tell you about Clown Train. You’ve probably heard of Improv Everywhere, “a New York City-based prank collective that causes scenes of chaos and joy in public places.” They are particularly known for their “No Pants Subway Ride,” an annual event where people in cities across the country do their daily commute sans pants. Clown Train is a prank that would be welcome in the Improv Everywhere repertoire. I wasn’t living in Chicago when my friends performed it, and despite talk about an encore, I left Chicago before it could be performed again. I m reporting this secondhand. One of the main El lines in Chicago is the Red Line, which runs from Howard on the very northern edge of Chicago all the way down to the South Side, going straight through downtown. The prank starts at Howard, where a clown enters the empty train along with the clutch of commuters. He stands there, holding onto the pole, looking dramatically bored and tired, just a clown on his way to work. People look at him strangely, but for the most part ignore him. You see all sorts of things on public transportation, and learn to not pay attention to most of it. The train stops at the next station, the doors slide open…and another clown walks in with the commuters. She finds a seat, pulls out a newspaper, and starts to deliberately flip through page by page. Another clown on her way to work. The clowns don’t acknowledge each other. The passengers start to get uneasy. At the next station, another clown boards. He has earbuds in, and is bobbing his head in time with the music only he can hear. He doesn’t acknowledge the other clowns. The commuters start to titter. Net stop. Another clown, this one holding a big bunch of balloons. He recognizes the other clowns! He gives them a large wave, his face pulled in a huge grin. One by one he exchanges silent pleasantries with the other clowns, and hands them each a balloon. The commuters are laughing. Next stop, another clown, and now they’re all interacting with each other. It’s a clown party! Their gleeful interactions spill over, and for the first time they engage the people around them, greeting and making mimed chitchat and handing out balloons. The train arrives in downtown Chicago, and the business people exit with balloons and grins. The clowns themselves exit en masse at Millennium Park, and spend the rest of the day interacting with people, mostly tourists, at times delighting and at times disturbing their audience. They give silent tours of the landmarks, then act confused when people ask them what tour group they work for. They wave at children and their parents, absolutely pleasant regardless of the reaction. They buy hot dogs from a vendor, and those hot dogs are the best hot dogs they have ever had oh my god you people have to try this. When the day is over, they all trundle back onto the train, exhausted, a group of clowns who have had a long day at work. Stop by stop they exit the train, waving goodbye to each other, until there is only one clown left, standing there, holding onto the pole, dramatically tired and bored. Just a clown going home. We should all have such whimsy in our lives. We should all bring such whimsy to the lives of others.